This is a live Gunnelpumpers set performed at Martyrs’ in Chicago on July 24, 2013. Performances by The Ham Council and Sophisafunk rounded out the evening. 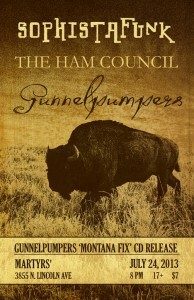 This was the CD release show for Gunnelpumpers fourth album, Montana Fix.